These Braised Beef Short Ribs with Cheesy Horseradish Grits are decadent and finished with a sweet and sour Porter Sauce. Divine. In 2010 I realized I wasn’t going to be heading either east or west to attend blogging conferences like many. I own a web business and the demands of that full time job just didn’t afford me the luxury of taking off for parts unknown yet I yearned to meet more of ‘my kind.’ Not one to sit and hope someone else will do something I wished done; I connected with another local blogger and we started a Meetup Group inviting local Denver bloggers to join us for a meet and greet. We’ve come a long way since then; some people popping in and out occasionally, some just once to promote their blog and some, and that was the hope, have become real friends. One of those is my friend Karen Harris of the blog Savoury Table blog who has been kind enough to do a guest post for me today. Though hailing from Texas; living in England with her family for a period fundamentally transformed Karen into a semi-Anglophile and her blog is evidence of the wide range of dishes from those two cultures. I asked my pal to help me out with a guest post today and I just LOVE what she’s done with the fabulous short ribs that were so graciously given to us by one of my new cowboy friends, Ty Gates of 5280 Beef. Thanks Karen and Ty! Barb asked me a couple of weeks ago if I wouldn’t mind filling in for her today. We all know it has been a rough time for her with her daughter’s illness and a big move looming, so I thought the least I could do was keep this ball in the air and give her a little time to spend with her girls. So Barb, if you are reading this, turn off your computer and go take Lauren and Em to lunch, I’ve got you covered. I really kind of owe her one or two. Over the time I have known her, Barb has done a lot of really nice things for me. I’ve gone to several blogger events and dinners as her guest, and many times she has passed my name along to contacts looking for someone to try out their products. This pattern held true when a couple of weeks ago, I got a call from her telling me to come on over to meet Ty Gates, a 6th generation cattle rancher and the owner of a company called 5280 Beef. She said he was on his way over to bring “us” some samples of his grass feed beef and tell us a little about himself and his business. Since I’m always in the mood to meet a cowboy bearing gifts, she didn’t have to tell me twice. Once we all got there and sat down together, Ty explained to us that along with his business partner, Mike Chewning, he owns and operates 5280Meat, located in Meeker, Colorado. He and Mike actually started their partnership while working in a corporate environment in Denver a few years ago. Through their working relationship and ensuing friendship, they soon discovered their mutual desire to provide consumers with high quality, healthy, and affordable meat products. It was from this common interest that their enterprise was born. The 5280 Beef herd, which is comprised of approximately 600 – 700 head of Black Angus cattle, grazes exclusively in northwest Colorado and is 100% grass-fed and 100% grass-finished. The herd’s water is sourced from the White River Valley and during the winter months, they eat home grown hay. Their cattle are free to roam and are never confined to a feedlot. These animals live in a healthy, low stress environment and are never given growth hormones, supplements, steroids or antibiotics. It is this attention to detail and consistent approach which results in great tasting and healthy beef products. On the 5280 Pork side of the business, there is just as big a commitment to quality as there is with their beef. Their natural, free-range pigs live in a healthy, low stress environment and are never given growth hormones, antibiotics, or steroids. These Hampshire/Yorkshire blended pigs eat an all vegetarian diet and are pasture raised exclusively in Meeker. They believe that pigs should roam free, where they can forage in a natural habitat and absorb vital nutrients from the land. Ultimately, it is this stress-free environment that produces a more healthy and nutritious meat. Just like 5280 Beef, the goal is to provide consumers a higher quality, healthier product that is naturally better. If you are interested in acquiring some of this superior meat, 5280 sells directly to the public through their website. Due to a limited supply, all orders are first come, first served. Unless stated otherwise on their website, they do have supply available for sale. Beef is sold in quarters, halves and whole. Pork is available in halves and whole. For more information and pricing, please hop on over to the 5280Meat website. Questions? Feel free to contact them; they are always available to help. To show off this delicious beef, I really wanted to prepare a standout dish that would do it justice, but there was only one problem, I needed Barb’s short ribs to make it. After a couple of days of hinting around she finally got the message and handed them over. I could tell that this was a real sacrifice for her because as I pried her fingers off the package, I swore I saw tears welling up in her eyes . . . but I took them anyway. Ahhhh, the things we do for our blogs. 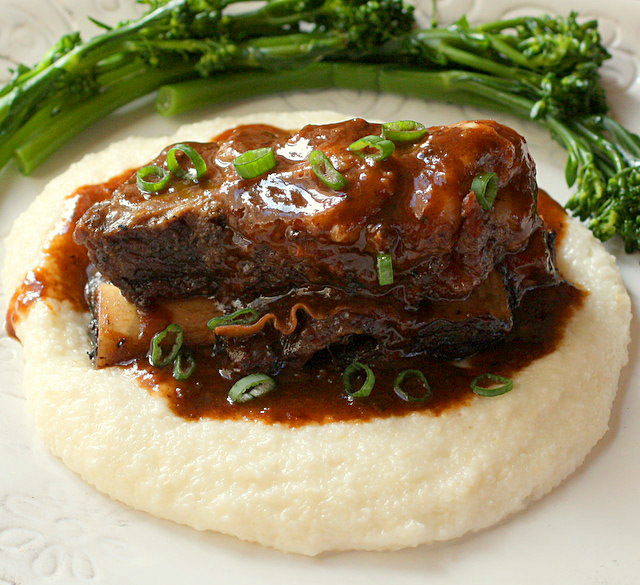 Slow cooked short ribs with a porter sauce are served over cheese grits. Season short ribs with salt and pepper to taste. Dust on all sides with flour; set aside. Heat a medium size skillet over medium high heat. Add oil and heat until it is hot. Add the short ribs and brown on all sides. Transfer to a slow cooker set to low. Pour the porter over the top then add the thyme, garlic and onion; cook for approximately 4 – 5 hours on low or on high for 3 hours or until they are fall apart tender. This can also be done by cooking them in an oven proof dish with a tight fitting lid in a 275 degree oven for approximately 3 hours. Remove the short ribs from the slow cooker and carefully transfer to a large plate, cover to keep warm. Pour the juices from the slow cooker through a strainer into a medium size sauce pan (they should measure approximately 2 cups). Cook juices uncovered over medium heat until they start to simmer. Stir in tomato paste, butter, brown sugar and vinegar. Reduce heat to maintain a slow simmer. Cook to reduce until mixture is slightly thick, approximately 15 – 20 minutes. Serve short ribs over a bed of grits (recipe follows), drizzle with sauce and sprinkle with parsley or sliced green onions. Place water in a medium size sauce pan over medium high heat. When water boils, add the salt and then slowly whisk in grits. Reduce heat to low, cover and cook for approximately 5 minutes until water is absorbed and grits are slightly tender. Remove from the cover and whisk in the half and half, cheese, garlic, horseradish and white pepper. Whisk until cheese is melted. Thanks Karen; I do hope you saved me one little bite; these look fantastic! One more note about Karen; she is what she herself calls ‘A Contester’ meaning she enters (and WINS big) contests calling for recipes from home cooks. She’s recently been selected as a semi-finalist in the 2013 Pillsbury Cookoff. PLEASE, I beg of you (I believe in being honest, I am begging you!! ), go vote for her Corn Pancakes with Maple Cream. They are simply divine! I have someone who is allergic to Balsamic Vinegar, what could I use as a sub? There really isn’t a substitute so you could just eliminate it or use a like amount of red wine vinegar with a bit of sugar added to mimic that slight sweetness of balsamic. These are the best short ribs I have ever made and really close to the best I have had in a restaurant. I used a Bourbon Barrel Stout and the gravy was out of this world. I will make this over and over! Thank you. I am always looking for new recipes to try…this one sounds so delicious! I can’t wait to make it! WOW! This is such a great beer recipe! Would love you to bring it by my Facebook beer recipe party on 4/20/13. These look awesome and I just adore her recipe and have -undoubtedly- voted for it. Everything looks delicious! This was like a two for one treat…finding Creative Culinary and Karen’s recipe. This just looks SO tasty, Barb!! 🙂 YUM Great idea! 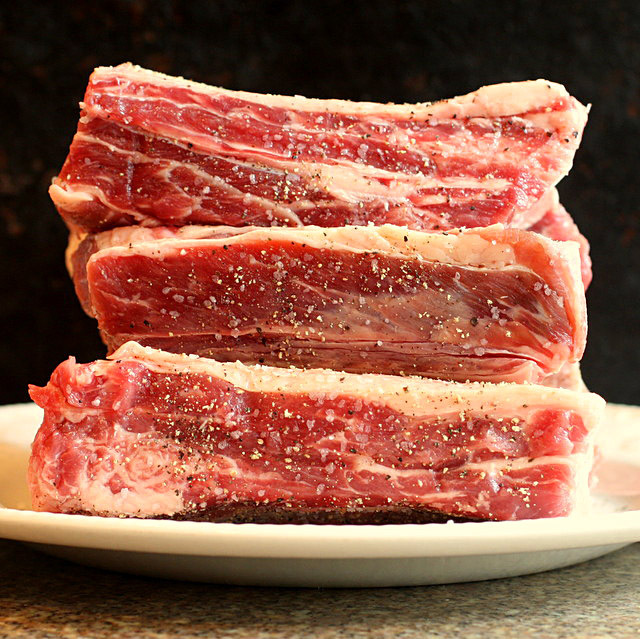 Short ribs are debatably my favorite food – when they’re on a menu, I order them, and these look sooo good! And cheesy grits? Yummy! Need to try this mean. Oh my word! It’s 9:00 in the morning and I’m craving a plate of these short ribs right now. I can just taste that combination with the porter, thyme, brown sugar, and balsamic vinegar. Yum and yum. Karen, those short ribs are gorgeous! Beautifully done. Good Luck with the contest. I hope you win ! You deserve to! Barb, did she bring you a teeny weeny bit of leftovers or not? So gorgeous! I can’t imagine how good those grits are with these ribs! Hardest part about a guest post? I didn’t get any either. Seems abjectly unfair doesn’t it? Hoping my pal saved me a bite! Ummm… those short ribs look fantastic!! Loved the story about 5280 Beef and Pork as well – it’s always interesting to talk to the people who raise our food, isn’t it? One thing I’ve learned is just how passionate they are about both their animals and the quality the provide to the consumers. I’m lucky to have met fellows from two smaller ranches but they’ve got me sold…and their beef is simply amazing. I’m a bit hooked. Great photos! Love the highlights. And such a nice recipe – short ribs have loads of flavor, and this recipe really does them proud. Wonderful guest post – thanks so much. Hi Barb and Karen, A great recipe for sure– beef, beer and the crock pot does most of the work? This is a recipe for me! Glad to learn about 5280 Beef, will be sure to check them out. 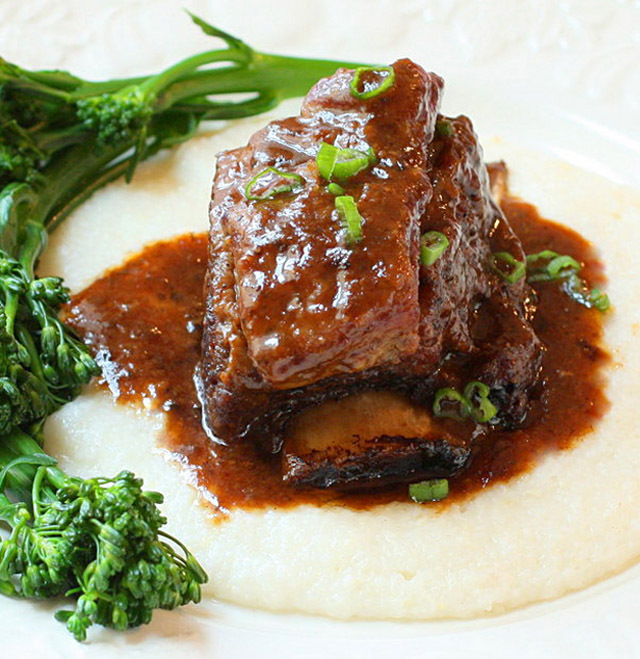 Beautifully done guest post and a gorgeous looking beef short-rib dish! Karen, these look incredible!!! Plus, the sound of cheesy horseradish grits completely has my mouth watering! Bravo on a beautiful plate of comfort! I don’t think you could have come up with a more delicious looking dish than this. You did such a wonderful job showcasing the beef and then that grits… well, I am a sucker for cheesy grits, so you definitely won me over with that.